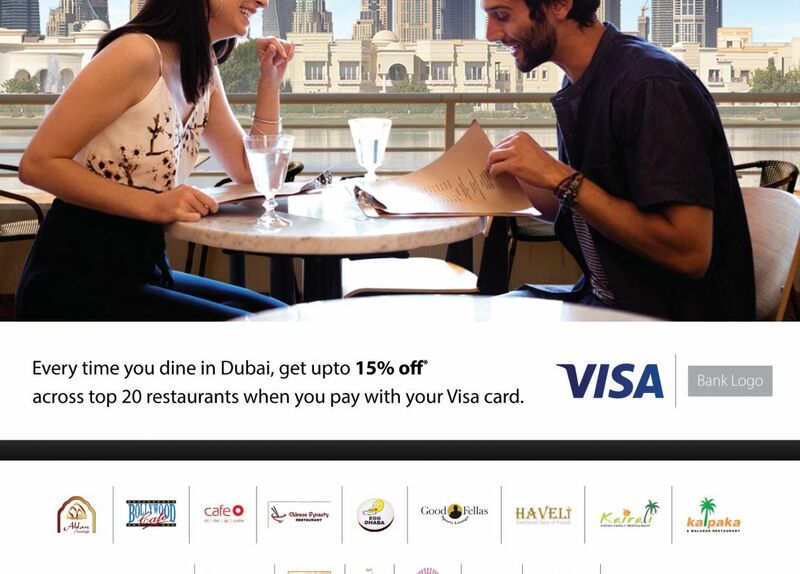 Have a delightful dining experience with Visa. 1. The Card member has to present his valid Bank Card to the restaurant and state the intention to use the offer before asking for the bill. 2. The benefits as mentioned here in above cannot be used or redeemed in combination with any other discounts or promotions or vouchers or 'Sunday Brunches' or 'Happy Hours' or any other such promotions. 3. The Offer is not valid on the Blackout Dates & Public Holidays, unless otherwise stated by the individual restaurant we advise to contact the restaurant directly before visiting. 4. The offers mentioned above are subject to change/withdrawal without prior notice. 5. This offer has no monetary value, is not transferable, is not for sale or re-sale nor redeemable for cash. 6. Offer is valid on A La Carte only. 7. Offer is not valid on group bookings (8 pax and above). 8. The discount is valid on only the net amount (excluding taxes or any other charges). 9. Any applicable taxes have to be paid by the card holder. 10. In case of any escalation, a copy of the bill is mandatory. 11. The offers are ongoing till the specified validity date. 12. The Offer doesn't guarantee the Reservations & Admissions at participating restaurants (Dining Partner), we advise to contact the restaurant directly before visiting. 13. Individual Restaurant Terms & Conditions apply. 14. Offer is not valid on Home Delivery. 15. In case the restaurant refuse the offer inspite of adhering to all the terms & conditions listed please retain and share the copy of the bill within 72 hours for Reference & Resolution. 16. Rights of admission are reserved by the restaurant.